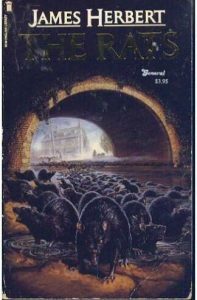 The Rats was James Herbert’s first novel. It was an instant hit and the success of this and many subsequent books made Herbert one of the UK’s top horror writers. The rat’s first victim was one of London’s many homeless. They ate their fill and then went looking for more. When they came for one-year-old Karen Blakely, the family pet, a mongrel dog named Shane, laid down his life to save her. One little dog against so many rats didn’t stand a chance and they took the girl over his dead body. Rats don’t attack people and they don’t grow to the size of a small dog. Everyone knows that, and so when people hear the first stories of the attacks they don’t’ believe it—it’s fear, an exaggeration, a mistake—but as the attacks increase becomes obvious to even the most sceptical that the City of London has a real problem on its hands. The first time that Harris hears anything about the rats is when one of his pupils walks into the classroom, rather late and sporting a rat-bite on his hand. Harris takes the lad to hospital, to get the wound looked at, but he thinks his pupil has been mistaken: a rat the size of a cat? No. He can’t have seen it properly. It must have been a kitten. Then a hysterical woman enters the emergency room, carrying what is left of her little daughter. The doctors see the woman first, and when Harris and the boy go in, and the doctor sees the wound, he says: “More rats?” Harris asks what he means and the doctor explains that he’s just treated a woman whose baby has been killed by rats. Many of the characters at the beginning of the book are little more than rat-fodder and the reader spends a chapter or so getting to know them, and then it is adios amigos. I suppose it would be possible to question why it is necessary to get to know a character that is destined to die within just a few pages, but I think it works very well because it is hard to identify with a nameless victim. When the reader has spent a little while getting to know the character, and is aware of their past, their hopes, and their dreams, it becomes more personal when they die. The main character is Harris. He is one of the few people in the book who manages to get up close and personal with the rats and survive the encounter; so he is enlisted by the powers that be, to help find an answer to the problem. The Rats is a little under 200 pages long and it is quite a scary book. I enjoyed reading it very much, and can highly recommend it, but the story may may not appeal to more sqeamish readers because some of the scenes are not just blood and gore, but blood and gnaw. Most regular readers of horror novels, should be fine with this one though, and if you are a Herbert fan it is a must-read-book.